This new 3D image of the moon was created by using images of the same spot of the lunar surface taken from different angles by NASA's Lunar Reconnaissance Orbiter. It shows the Korolev lobate scarp, a type of cliff mostly found in the moon's highlands. Image released Sept. 25, 2012. Scientists are creating eye-popping new views of the moon in 3D with the help of a prolific NASA lunar probe currently orbiting Earth's nearest neighbor. The new 3D moon pictures were assembled from photos snapped by NASA's Lunar Reconnaissance Orbiter, which has been snapping high-resolution views of the moon's surface from lunar orbit since 2009. 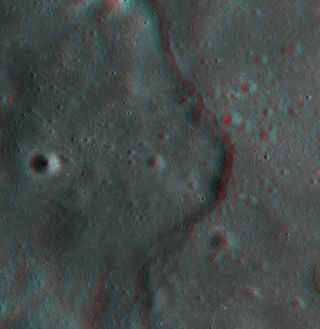 The spacecraft does not have a stereo camera aboard to take 3D anaglyph images of the moon, but scientists were able to stitch together photos of the same region— taken from different angles and orbits — to artificially create the three-dimensional lunar views. Mattson will present the 3D moon photo project to scientists at the annual European Planetary Science Congress in Madrid on Tuesday (Sept. 25). This view of the moon shows the vast Janssen K crater in 3D as seen by NASA's Lunar Reconnaissance Orbiter. It is a roughly 12-kilometer-diameter crater on the floor of the large Janssen Crater. Several debris flows can be seen running down the walls of the crater. Image released Sept. 25, 2012. Mattson and her team have created hundreds of 3D views from moon photos by the Lunar Reconnaissance Orbiter. The orbiter's narrow angle camera can only observe the moon from one angle at a time, so the researchers developed an automatic image processing system that combines the photos into anaglyph pictures that can be viewed with standard red-cyan 3D glasses. NASA launched the Lunar Reconnaissance Orbiter in 2009 on a mission to map the moon's surface in unprecedented detail. The $500 million orbiter was built to seek out potential landing sites for future missions, study the lunar radiation environment and search for resources such as water ice in the moon's permanently shadowed craters.